What are 'quackbusters', you might ask. The "quackbuster" operation is a conspiracy. It is a propaganda enterprise, one part crackpot, two parts evil. It's sole purpose is to discredit, and suppress, in an "anything goes" attack mode, what is wrongfully named "Alternative Medicine." It has declared war on reality. The conspirators are acting in the interests of, and are being paid, directly and indirectly, by the "conventional" medical-industrial complex. 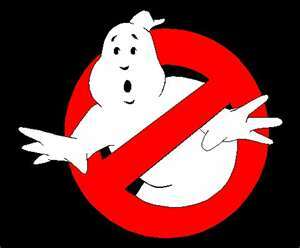 These so-called quackbusters seem to be a branch of a larger movement, the "skeptics". Their website at www.skeptic.com/ shows who they are. Skeptics think of themselves as having opinions based on scientific 'truth'. They are very outspoken and very much "out there" to disabuse the rest of us of any idea that does not fit into their version of the scientific world view. Mercury and fluoride for instance are not poisons for skeptics, and anyone who thinks they are must clearly be a conspiracy nut. Vaccination is good for you, as are chemotherapy and radiation cancer treatments offered by conventional medicine. If you oppose either of them you are simply a 'quack' or at the least you are an easy target for those who take advantage of your stupidity. The practices of alternative medicine, including "chiropractic, the placebo effect, homeopathy, acupuncture, and the questionable benefits of organic food, detoxification, and ‘natural’ remedies" are a favorite subject of the skeptics. They know that only mainstream medicine should be relied on and everyone who is into those practices really needs to have their head examined. For a real skeptic, anyone with psychic abilities is a fraud. It goes without saying that no one can possibly be able to influence the physical world with their mind without cheating like a stage magician. Those who question the mainstream hypothesis that a trend of global warming is caused by human technologies emitting too much CO2 or by cow poop producing methane gas are labeled "deniers" by the skeptics. Regardless of what you think about global warming, a scientific hypothesis is always open to question. Experiments or new insights either confirm or contradict the hypothesis. That is how science works ... or how it is supposed to work. The three skyscrapers that collapsed on September 11, 2001 did so substantially on their own, brought down by rather smallish fires. Anyone who thinks that there may have been foul play or controlled demolition at work has been misled, according to the skeptics who, strangely, don't seem to be skeptical about the official story at all. Well, you get the idea. The skeptics seem to be a bunch of cynical know-it-alls who believe they have been fed wisdom by the spoonful from the time they were very small. And then there are, mainly in North America, the 'quackbusters', those skeptics who concentrate their efforts on alternative medicine. Tim Bolen at his website - quackpotwatch.org - has some scathing remarks about them and he reports, on his site, about a streak of bad luck these so-called quackbusters are having in recent legal cases as a result of their reporting and challenging before the medical boards some of the more successful doctors who practice natural medicine. What is this Web of Trust and how have the quackbusters been using it to their advantage? The web of trust is a crowdsourced rating system for websites which means that in an ideal world people, as they surf the net, rate sites depending on whether they find them reliable or not, whether they had a good experience buying something there or not, or whether they would allow their children to see a site or not. Since this was done as a well organized group action, we now have a situation where many of those site ratings are somewhat slanted ... towards the view of the skeptics. Natural alternatives are bad, pharma is good, conventional medicine can do no harm. I believe it is time to undo that damage and I would like to enlist your help. Here is what you can do. and here is a video that explains how WOT is supposed to work and what the ratings mean. Get your copy, install it with your browser and start looking around at your favorite health related sites, to see how they are rated. As you see each site, you will be able to give your rating for the site. Don't be shy. "Ethical issues - It shows that AZT treatment for HIV and fluoridation are all fraud... I think THEY are fooling us." "Adult content - Diese "pseuodheilmethoden" haben schon Leben gekostet, wie im Fall von Geerd Hamer auch von Kindern. [These pseudo healing methods have already cost lives, even of children as in the case of Geerd Hamer]"
"Ethical issues - medical advice about as useful as a doctor who does not believe in germs"
"Hateful or questionable content - What can I say, other than that this site is dangerous for medical advice, is batsh!t insane, and is pro-psuedoscience and pro-psuedohistory. And the web design hasn't really changed since 2002, it seems." "Hateful or questionable content - Stupidity, conspiracy theories and outright bigotry. As nutty as a squirrel's breakfast and as informative as a Glaswegian drunk. Dangerous for your health." "Ethical issues - This site is filled with lies, fake science and bull5hit"
"Useful, informative - I came to this site to look up "Human Radiation Experiments" - which occurred in the 50's thru the 70's and the info is accurate. I'm not sure what all these other people are talking about, but I give this site a high rating based on what I am researching." but those aren't that many, and they are listed far down the list of comments. Each user also has a voice in rating comments, which sends the individual comment to the top (if rated "up") or down to the bottom (if enough people disagree and rate it "down") of the listing. I have started using WOT and have also commented (and voted on comments), but of course one person makes little difference. That is why I am asking your help here. The skeptics are very busy, but their numbers aren't that great. Even just a hundred or two hundred users who appreciate natural medicine and proper, un-censored information, can reverse the damage and bury the skeptics. WOT ratings of a site also influence google results. So helping with the voting will bring the natural alternatives into view again on searches and it might plummet the rating and listing of skeptic sites, which seem to be at the very top of the heap right now. We will be much better off for it, as information once more starts to circulate freely and without that artificial distortion imposed by the skeptic crowd. WOT has become a nest of anti-anything-that-isn't-corporate-controlled science. The site purports to be an arbiter of safe browsing. It's anything but that. It's nothing but a bunch of people who want to control what we can see. Their voting system is mob control at its worst. The sites they focus on are not ones that might be risky - pHishing sites, for example. There is one point that should be noted: WOT does not use comments as part of its rating system. Only votes are counted. Also, if the comments supporting a site start to overwhelm the ones that are against it, they stop allowing comments! There are absolutely no controls to assure that crowd attacks on sites are legitimate. For example, sites (like mine) that don't sell products are often routinely rated badly under the vendor category. It's obviously absurd. Yet, nothing is done to correct it. In fact, when a complaint is made to correct the problem, the result is an even more concerted attack on the site! WOT may end up serving us well. 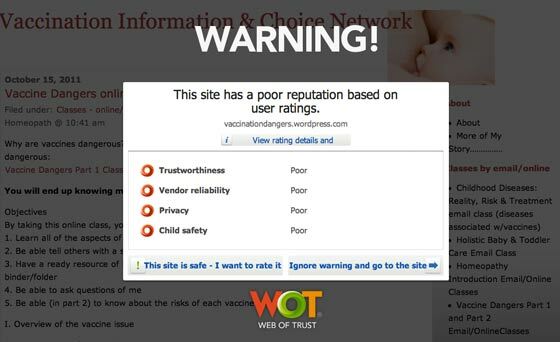 I've found it to be a reliable indicator of sites that aren't worth my time - such as big-money-controlled sites, like Huffington Post or major newspapers or pro-corporate medicine like Medline - by noting whether they have positive WOT ratings. If they do, then it's usually advisable to move on, as they'll have little to offer beyond what's in the local rag and its advertisements. I'll take the skeptics, and other evidence based science, rather than the wishful thinking, conjecture, cherry-picking and other bad science and anecdote that is the alternative. BTW, did you know that for a LONG time there has been a huge reward to anyone who can show ESP? James Randi, I think, nobody has claimed it yet. Well julie, there's plenty of cherry picking and at times awful science going on in "evidence based" science. Just look around the news a bit. As for the Randy award, the reason no one had been able to successfully claim it is that Randy is like a slippery snake. He is judge and jury all in one, and when it looks someone would win, he moves the goalposts. Randy is a fake.